My long time friend Elizabeth is a wealth of anecdotes, wisdom and classic Bostonian common sense when it comes to weddings. 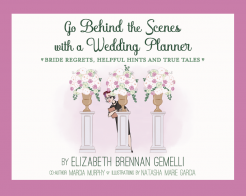 If you are planning a wedding, or know someone who is in the throes of it, this light hearted and helpful book will take a little pressure off. ’m not sure what I would have done without Elizabeth’s advice, guidance and attention to detail while planning my wedding. She helped me with so many details I would have overlooked—everything from the sequence of the ceremony she performed to the logistics of the flowers. She did it all in a way that felt true to what we wanted. As a videographer, knowing the flow of events for the wedding day is crucial to keeping it organized and well run. Elizabeth is a joy to work with. She knows the vendors and shares the sharp and detailed timeline she created which they follow with ease. She keeps an excellent pace while never rushing anyone and the day always goes smoothly and with a smile. Elizabeth Brennan Gemelli was born and raised in Boston, MA. She has been in the wedding planning business for over 30 years and has seen it all. She started “Weddings by Elizabeth” and has had a long, successful, and gratifying career as a wedding planner. Now a Justice of the Peace, Elizabeth enjoys being surrounded by the love of wedding planning.